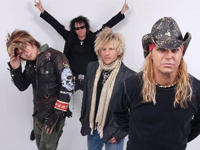 In a decade fueled by party anthems and power ballads, Poison found a high amount of popularity, with only Bon Jovi and Def Leppard outselling them. While the group had a long string of pop-metal hits, they soon became just as renowned for their stage show, and continued to be a major attraction over the course of their first three albums. Although their commercial success was rather short-lived, one cannot deny the major effect that Poison had on the music industry during their heyday. Formerly known as Paris, Poison was formed in 1984 by singer Bret Michaels, bassist Bobby Dall, and drummer Rikki Rockett. After traveling from Harrisburg, PA, to Los Angeles, CA, the band added guitarist C.C. Deville to their lineup. The group was signed to Enigma Records in 1986, where they released their first album, Look What the Cat Dragged In. The record, spawning the Top Ten hits “I Want Action,” “Talk Dirty to Me,” and “I Won’t Forget You,” was a surprise success, selling two-million copies within a year following its release. While the band was already quite popular by the end of 1987, 1988′s Open Up & Say…Ahhh! was their commercial breakthrough, due to the massive hits “Fallen Angel,” “Nothin’ But a Good Time,” and “Every Rose Has Its Thorn.” After a prosperous tour with David Lee Roth, the group returned to the studio to record Flesh and Blood in 1990. The album, which included the upbeat “Unskinny Bop” and the sentimental “Something to Believe In,” was another major success. The dynamic tour supporting the record brought on the release of Swallow This Live, a double-disc set which included live versions of their biggest hits, along with four new studio tracks. The band was secretly falling apart, as an infamous appearance on MTV showed Deville perform nearly half of “Talk Dirty to Me” with his guitar unplugged. The band broke into a brawl backstage after the disastrous performance. Shortly after the release of Swallow This Live, Poison fired Deville due to his increasing addiction to drugs and alcohol. His replacement, Richie Kotzen, made his commercial debut with the band on the 1993 Native Tongue album, which, despite some strong reviews and a hit single, “Stand,” was a commercial disappointment. Kotzen was fired during the subsequent tour, and Blues Saraceno became Poison’s third guitarist. The band recorded their fifth studio album, Crack a Smile, for release in 1996, but the record was shelved and replaced with the Greatest Hits: 1986-1996 disc. Toward the end of 1996, Saraceno left and Deville returned to the band, which eventually resulted in a successful reunion tour in the summer of 1999; the Crack a Smile sessions were finally released the following spring, soon followed by the mostly live Power to the People. Another tour was cut short by an accident that left Dall with serious back surgery and at least a six-month break from the band. By the time he got back into shape, the band stepped into the studio and recorded Hollyweird, which was released in the summer of 2002. The following tour was promoted as a nostalgia experience and was funded by VH1, laying the brickwork for a lucrative relationship between the band and the television channel. Deville would later appear in the network’s sixth season of “The Surreal Life”, while Michaels was awarded his own show, “Rock of Love with Bret Michaels”.